The Bagan Princess has the most peculiar layout and decor, making you wonder what the architect had for breakfast, but it does work in an odd way, and some of the equally odd room rates are pretty good too. Average rating 6.2 from 239 reviews. The decoration is brick and laterite blocks -- all painted a dark brown -- and they extend into the interiors of the rooms. The reception begins in relatively normal fashion though its dark wood finish follows through to an adjacent, old-fashioned, tavern-like restaurant. It looks interesting, though it did seem like the kind of place that could have had a hobbit or dwarf hiding in one of the darker corners. Beyond this, stone stairs and tunnel-like passages lead to the superior and deluxe rooms, set on two levels around a slightly incongruous second floor swimming pool. Rooms are also on two levels, set on stone pillars over a murky fishpond which seemed to underlie most of the accommodation. (Hopefully the fish like eating mosquito larvae.) Standard rooms are apparently in an adjacent section, but staff seemed disinclined to lead us there and their directions led us into the laundry room so we gave up. They were much keener to show us their superior and deluxe rooms. The former is located on two floors above the restaurant, the latter providing shade for the fish. Some second level ones look onto the pool and some don’t, which we guess accounts for the odd pricing. Upper ones are brighter, though an extra $70 is a bit steep for a view of the admittedly cute pool. Interiors of all rooms are solid, with plenty of room, air-con, minibar and cable TV and spacious bathrooms; deluxe rooms even have their own Jacuzzis. Location is not a strong point as it’s a fair hike down Main Road from this Wet Kyi Inn spot to Nyaung U’s cafes and restaurants. 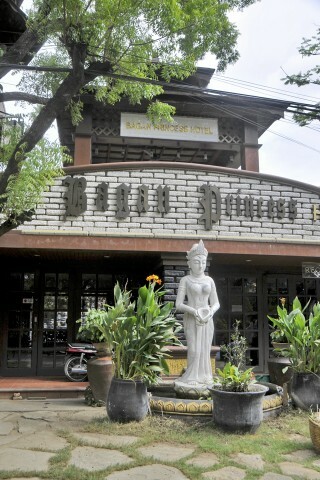 Check rates at Bagan Princess Hotel on Booking.com.